These four slides (all slides available here) represent my allotment of time and effort at different stages of my career related to clinical practice or application of knowledge, integration of knowledge, discovery/advancement of knowledge, and dissemination. Prior to entering my doctoral program, I was employed as a speech language pathologist in a school for children with special needs. On my caseload were several children with cerebral palsy who were unable to meet their communication needs because their speech was very difficult to understand. Because the augmentative and alternative communication (AAC) field did not exist at that time, I was not prepared to support their communication needs. After a couple of years in this position, I entered a doctoral program. 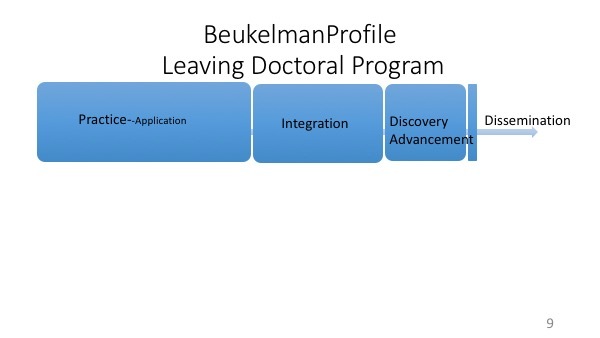 Slide 8: As I entered my doctoral program, my major focus was clinical practice. I knew I wanted to provide effective services for persons with complex communication needs, but at that time there was little research, and little practical Clinical Knowledge to be shared, even informally. 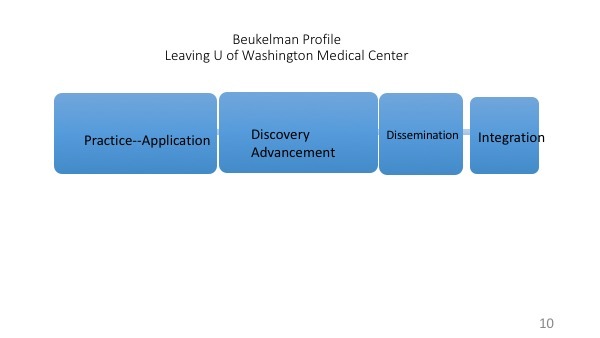 I had very limited involvement in Dissemination, and had not acquired the research skills to support Discovery/Advancement, but I did try to integrate information from a variety of fields to support my clinical efforts. 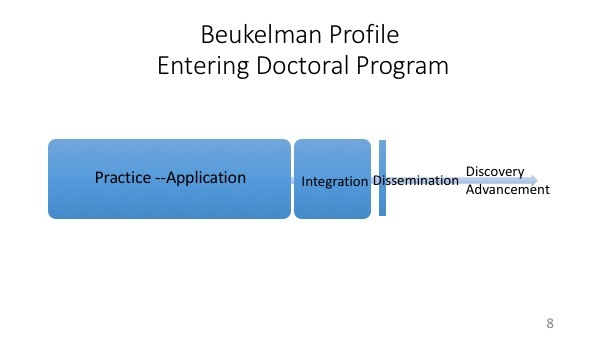 Slide 9: When I graduated from my doctoral program, I maintained a strong Clinical Practice orientation. 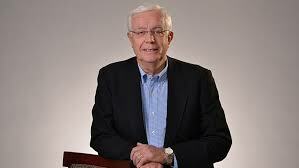 I had increased by interest and capability in Discovery/ Advancement, but was involved in little Dissemination. Slide 10: For a decade, I held a clinical research position in a Rehabilitation Medicine Department at the University of Washing Medical Center. During my time in that position, my Clinical Practice emphasis was maintained, but my Discovery/Advance focus increased considerably, and my Dissemination effort increased gradually as my colleagues and I published our research findings and an introductory book describing our AAC interventions for children and adults. Background: I was first introduced to children with cerebral palsy who were unable to speak intelligibly employed as a speech language pathologist in the Chicago area. Unfortunately, at that time, AAC field did not exist. Later, I began an AAC program to serve children and adults at the University of Washington Medical Center. 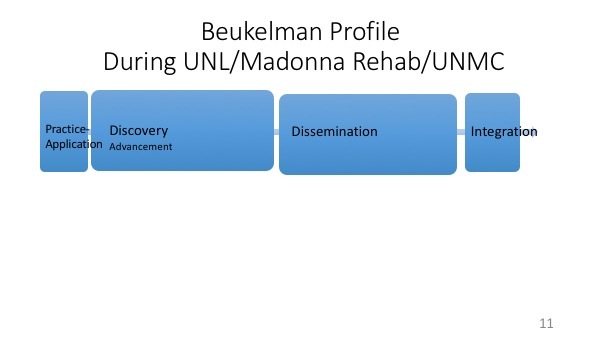 Since transitioning to the University of Nebraska-Lincoln, I have had collaborative research relationships with the Madonna Rehabilitation Hospital and the Munroe – Meyers Institute for Genetics and Rehabilitation where we focused on informatics research investigating the intervention experiences and outcomes of adults who rely on AAC, and we also have identified design features for emerging AAC technologies. Current Interests: My current research focuses on patient – provider communication in medical settings, visual scene displays for adults with severe, chronic language disorders, and multi-modal communication options for people with limited technology access options. Sample Presentation/Publications: In addition to research articles and presentations, I have co-author several books including: Augmentative and alternative communication for children and adults (Fourth Edition). Communication and Patient-Provider Communication: Roles for Speech-Language Pathologists and Other Health Care Professionals.